As reflected in legends and mythological tales, the interplay between nature and nurture has fascinated humanity since ancient times. And the nature/nurture debate grows only more interesting in the light of scientific progress. Such progress, however, has been a bit one-sided. While the nature side is examined ever more comprehensively—genomically, transcriptomically, proteomically, and metabolomically—the nurture side is relatively unexamined. Nurture, however, is starting to get more attention. Increasingly, it is being viewed exposomically. The exposome is the accumulation of a person’s environmental exposures from conception onward. A person may come into contact with agents that have internal sources, such as hormonal fluctuations, inflammatory processes, and preexisting health conditions, or agents that have external sources, such as air, water, diet, infection, radiation, and stress. The term “exposome” was introduced by Christopher P. Wild, Ph.D., director of the International Agency for Research on Cancer (IARC) of the World Health Organization. In a landmark 2005 publication, Dr. Wild proposed that the exposome could complement the human genome in investigations of the causes of human diseases. If the exposome concept seemed speculative at first, it soon attracted a serious following. Emboldened by technological advances, scientists expressed interest in exploring the effects of environmental exposures on development, phenotypic traits, and medical conditions. In hopes of advancing this new field, Dr. Wild advocates the development of novel and more powerful methods to survey exposures. The possibility of collecting information about multiple parameters from only one or a few measurements has emerged as an attractive option with the implementation of varied omics approaches. “There are many things that we do not yet understand but could affect the fetus over the long term,” says Rohan M. Lewis, Ph.D., reader in physiology at the University of Southampton and leader of the Placental Research Laboratory. 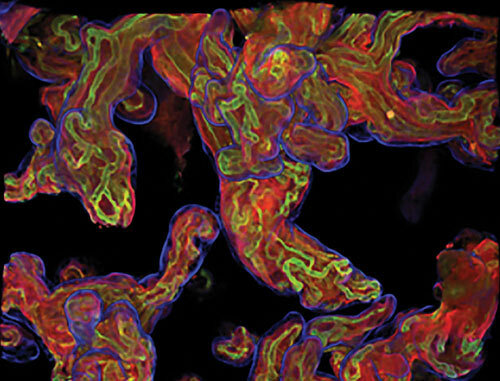 Dr. Lewis and colleagues recently coined the term “placental exposome” to refer to the assembly of exposures during gestation that may shape health after gestation. In studies that examined the effect of placental transport systems on fetal plasma composition and fetal growth, Dr. Lewis and colleagues reported that maternal 25-hydroxyvitamin D and vitamin D-binding protein levels were positively associated with the placental gene expression of amino acid transporters. This pointed toward the importance of modifiable maternal factors in shaping fetal development and health. “We are trying to develop a more systems biology approach to study different transporters and understand why an exposure leads to a specific outcome,” states Dr. Lewis. While the definition of the exposome includes all exposures that occur from conception and throughout an individual’s lifetime, an emerging concept is the need to also consider exposures prior to conception. “We are interested in things that happened to the mother or the grandmother and could affect the offspring,” details Dr. Lewis. Maternal oocytes begin their meiotic maturation and imprinting in the grandmother’s uterus, and the prolonged survival of the immature prenatal oocytes is one of the distinguishing features of gametogenesis. “We should be able to characterize exposures not just at a specific moment in time, but over the entire lifetime of an individual—and especially during early life, which is a time that influences disease risk later in life,” says Tim Nawrot, Ph.D., professor of environmental epidemiology at Hasselt University and Leuven University. In recent years, technologies that are assuming key roles in assessing the exposome, such as transcriptomics, proteomics, and epigenomics have improved substantially, and the availability of larger platforms has been paralleled by a decrease in the costs. “This allows more labs to use these technologies, and opens the possibility of collecting more datasets and setting up larger studies,” explains Dr. Nawrot. An example of a large study is the European EXPOsOMICS consortium, led by Dr. Paolo Vineis. A major research effort in Dr. Nawrot’s group is focusing on understanding in utero factors that shape disease risk later in life. In a comparative risk assessment analysis, Dr. Nawrot and colleagues recently examined triggers of nonfatal myocardial infarction at the individual and the population levels, and revealed that air pollution contributes with a magnitude similar to that of several other well-established triggers. “One of the reasons why air pollution is an important environmental factor is that the whole population is susceptible, and exposure can occur over small distances exposed,” asserts Dr. Nawrot. In another recent study, Dr. Nawrot and colleagues examined women enrolled in the ENVIRONAGE birth cohort study from Belgium. Part of this work involved the analysis of genes belonging to the brain-derived neurotrophic factor signaling pathway in placental tissue and concomitant trimester-specific estimates of fine particle air pollution around participants’ homes. Placental expression of brain-derived neurotrophic factor and synapsin 1, two genes involved in nervous system development, synaptogenesis, and cognitive function, was found to decrease as a result of the in utero exposure to fine particle air pollution. “The relevance of these findings is that because early life is a very sensitive period, changes that occur in the placenta are a reflection of things that may happen later on during fetal brain development,” explains Dr. Nawrot. “We extended methods that have been used for genome-wide association studies, and mirrored those approaches to perform environment-wide or exposome-wide association studies,” says Chirag J. Patel, Ph.D., assistant professor of biomedical informatics at Harvard Medical School. One of the major outcomes of the Human Genome Project was that it provided research tools and data that were instrumental for conducting genome-wide association studies, which helped explore connections between genomes and phenotypes. “We would like to do the analogous thing for the exposome, and eventually analyze large repositories of environmental information to understand the connection with disease,” relates Dr. Patel. To characterize the effects of environmental exposures on biological parameters, Dr. Patel and colleagues are using computational approaches to examine the correlations and dissect the interactions between different exposures. In several environment-wide association studies, Dr. Patel and colleagues illustrated the possibility of identifying factors associated with specific phenotypes and generating new hypotheses about the association between exposures and disease. One of these studies analyzed the correlation between fasting hyperglycemia and serum and urine biomarkers. It found significant associations for 10 of 266 environmental factors. It also revealed that a significant link exists between heptachlor epoxide exposure and type 2 diabetes mellitus. In another study, Dr. Patel and colleagues revealed that several of 249 environmental exposures that were examined (including serum and urinary cadmium, the number of cigarettes smoked per day, and physical activity) are significantly associated with all-cause mortality. 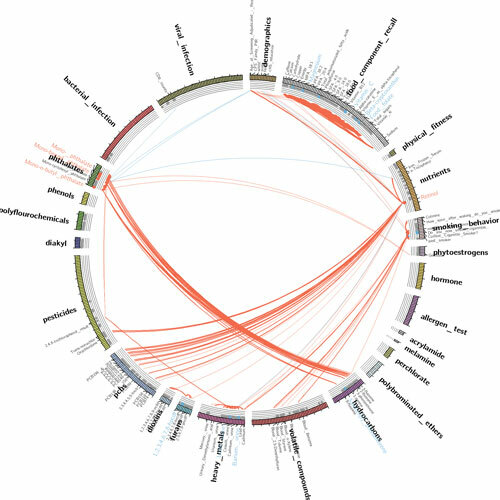 To reflect the interconnectedness of the factors that shape the exposome, Dr. Patel and colleagues coined the term “exposome globe.” The exposome globe describes the network of correlations between individual exposures that encompass the exposome and can be replicated. “To develop the exposome globe idea, we tried to understand how exposures are connected to one another,” explains Dr. Patel. In a proof-of-concept study, Dr. Patel and colleagues analyzed approximately 200 exposures and tested whether high exposure to one factor would be indicative of high exposure to other factors. “Unlike for genetic variants, in which the correlations are relatively sparse and well characterized, a phenomenon known as linkage disequilibrium, exposures are highly dependent on one another,” notes Dr. Patel. This concept is reflected by the example of a healthy diet, when the status of multiple nutrients is often interconnected, or when high plasma levels of one vitamin may indicate high levels of another vitamin. Assessing the exposome and its links to disease are intimately dependent on technologies that are used to collect and characterize the data. “These technologies need to be robust, and they should be able to detect compounds at very low levels,” insists Dr. Patel. 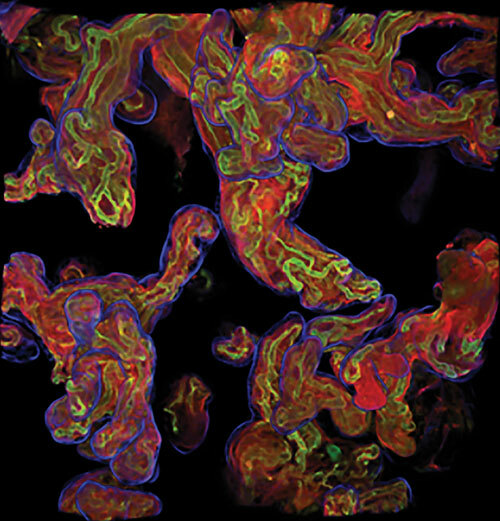 Metabolomics, which is powered to capture the chemical fingerprints that are generated as a result of cellular processes, is emerging as one of the valuable tools for characterizing the exposome. This has been greatly facilitated by the ability of metabolomics approaches to measure up to approximately tens of thousands of metabolites in biological samples.